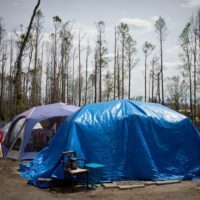 Survivors of Hurricane Michael in the Florida Panhandle fear they have been forgotten | Insurance Litigation Group, P.A. Six months after Hurricane Michael hit the Panhandle, there are still concrete blocks, rebar, and pipes and planks mounded on the side of the road and the landscape is stripped of trees and plants. Government agencies have cleared the roads and utilities have restored power, water and communications, but thousands of people are still desperate for permanent housing (many still living in damaged homes, trailers and tents), competing not only with one another for the scarce supply of rental units, but with construction workers who have come into the area.